I encountered this surreal moment in western Ireland. 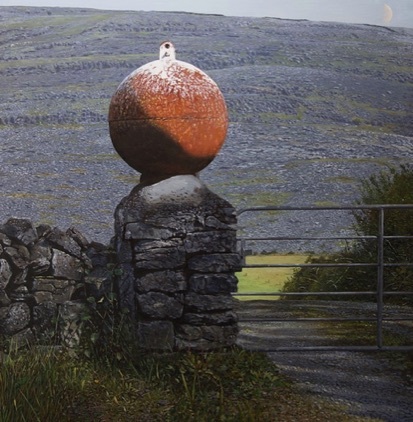 The marine mooring buoy, lit by the afternoon sun, seemed suspended like some planetary orrery against the lunar limestone landscape of the Burren. The strange intruder is watched by the daytime moon (upper right). When I returned a second time to survey the scene the wall pier had been demolished and the celestial imposter had moved to some unseen coordinates.